We are creating a wildlife pond because water is an essential part of any wildlife habitat as well as being an attractant for many of the organic gardener’s allies, such as toads, frogs and newts. We also wanted to create a breeding site for great crested newts (a protected species) which were already present in the gardens. clay layer under the topsoil. This means that the clay was compacted and then polished to form an impermeable layer. Traditionally this is done by driving sheep through the pond. Here it was done by driving large vehicles through it. The first two attempts were unsuccessful, and although the pond filled up, it rapidly emptied again. In February 2003 a third attempt was made to seal the leak. This time it was successful. 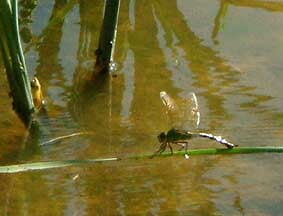 As soon as the pond stopped leaking the newts moved in and were busily breeding all spring, followed by dragonflies and damselflies in late summer. However, after 8 months of drought during 2003, the pond virtually dried up and the clay lining baked in the heat of the sun. It wasn’t until the end of December that the pond was full again, but our Wealden clay dried out so much during the summer that the cracks run quite deep, and at the moment the pond is leaking again. There is a good chance that this will right itself as the cracks seal and silt up, especially if we don’t have another drought, and then we can look at introducing native oxygenating plants and water lilies into the water. The other thing we will need to do over winter is to lower the marginal shelf, as we can now see that this went in too high and is hardly ever covered in water. 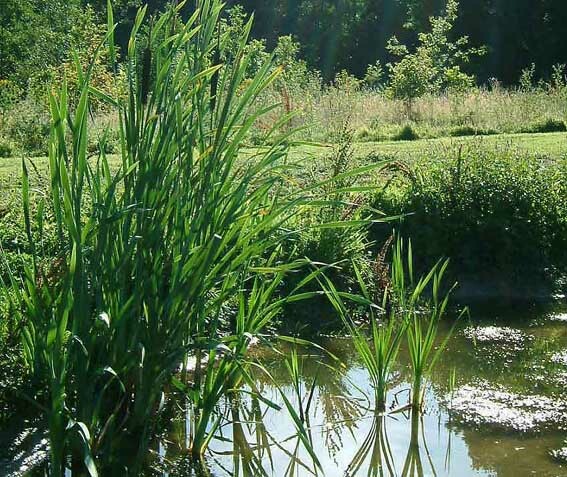 We have planted trees and shrubs around the pond to provide shelter and foraging for the wildlife, and the grass is left long to give creatures such as newts and toads a safe corridor to travel to and from the water, across to the Spinney and into the Nuttery. In this way all the different wildlife habitats we are creating begin to link up.